Natural language processing has the potential to make life easier for coders and CDI specialists, but challenges remain. As healthcare organizations search for ways to bolster their clinical documentation improvement (CDI) efforts, one tool that continues to garner interest is natural language processing (NLP) technology. This speech recognition software can convert EHR data into structured, searchable content and help coders quickly sift through enormous amounts of information. But does it really hold the key to CDI success? Automation of time-intensive, resource-sapping tasks in the documentation workflow is one of NLP’s primary benefits. “If you’re part of the documentation improvement cycle and you try to identify key characteristics in that documentation, natural language processing-type technology can help to hone in on those anomalies,” says Carl Cresswell, chief technology officer at Clinithink. Through the use of NLP, this can be accomplished across large volumes of documentation, with consistency in both the approach and the application. “Humans, obviously, are prone to be a little bit subjective in the way they analyze things,” Cresswell says, adding that computers can review and evaluate content more consistently. Morsch says EHRs often are verbose, making it difficult to sift through the documentation without missing key information sources. In terms of efficiency, NLP technology offers additional benefits by extracting a tremendous amount of clinical evidence in a relatively short amount of time compared with how long it would take CDI specialists to manually review the same number of records. Automating routine tasks may free CDI specialists to concentrate on areas where the technology is lacking. Parkland Health & Hospital System in Dallas recently implemented NLP. Robin K. Stults, RHIA, CHC, senior vice president of HIM, says the goal is to better position her team to meet ICD-10 demands, in particular the level of documentation specificity required by the new code set. The amount of data that nurses don’t have access to unless they dig through charts manually makes NLP a time-saver. “With the use of NLP, you can absolutely begin to extract [information] quickly,” Stults says, and not just more quickly than tackling the data manually. NLP helps facilitate concurrent review, something Stults anticipates will be a benefit. Industry experts point out that NLP is not foolproof. Using the software intelligently is a foundation to avoiding potential pitfalls. “You want to understand the limitations,” Morsch says, pointing to handwritten progress notes and other sources of information that may be out of NLP’s reach. Developing protocols that address a hospital system’s particular needs or expectations is critical to plugging holes. “You need to make sure that the recommendations and the logic that the system is using is consistent with the CDI policies and programs of the specific organization,” explains Morsch, who says recognizing what is accessible should be an early step so that potential information gaps can be identified. Parkland is focusing on clarification procedures as one way to avoid such obstacles. Stults says nuances in best practice standards and protocols should be carefully constructed to fit into an organization’s overall design. Getting the best results often hinges on implementing NLP in the right place. Parkland has put its NLP platform at the beginning of the workflow. “To me, there’s more value in the front end than there is at the back end,” Stults says. Facilitating an effective concurrent review process is a priority for her team, not only because it helps improve efficiency, but also because it’s financially prudent. Stults believes these efforts will be enhanced by early leveraging of speech recognition. “If I can use the information that comes from it to influence or create appropriate intervention on the front end, I would rather do that,” she explains. Juergen Fritsch, PhD, chief scientist at M*Modal, says speech recognition platforms often are used on the back end of the coding process where the HIM department is tracking down deficiencies and posing physician queries. However, that setup may not be around much longer. “We view [NLP] as more of a real-time workflow in the future, where the physicians can get immediate feedback from the technology,” he says. By facilitating information gathering in real time, the risk and number of deficiencies will be reduced as the documentation is being created. This approach requires coders and CDI specialists to be in the loop concurrently, which will in turn allow them to continue fine-tuning the technology to better meet their needs. It’s a team approach that Fritsch says may result in better efficiency and greater cost-effectiveness. For now, however, NLP technology primarily is used at the point of discharge, which Morsch says is consistent with workflows but is not a particularly efficient strategy. “The direction is really to move it to be concurrent with the patient’s stay,” he says, pointing out that this approach offers advantages from a CDI perspective because NLP could be utilized as documentation is being created. However, a concurrent approach presents a significant hurdle. 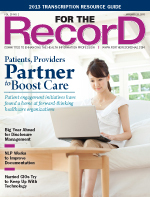 “You might not have a full context of the medical record at that point,” Morsch says, adding that if broader parts of the EHR haven’t been fully integrated by the time NLP is applied, then coders may fall behind and the hospital’s investment in speech recognition technology could subsequently be undercut. In reality, there isn’t a single workflow that fits every hospital’s needs. For those groups that are still figuring out where NLP might make sense, Cresswell offers some suggestions. “If you’re trying to embark on an audit initiative, the technology can help in that kind of space,” he says. The consistency that comes along with NLP could hit the sweet spot for some HIM departments. Retrospective documentation analyses also might be a worthwhile opportunity. “This type of technology can help get users to the right point and then exploit their knowledge to process the documents more fully,” Cresswell says. There’s a good possibility that coders will have a different approach to the query process when NLP is part of the equation. In some cases, the technology may offer greater confidence in exactly how much and what type of evidence the documentation presents and whether there is enough to query on. “It also changes the query process because they are able to electronically link together the queries themselves with the underlying source of information from the medical record that support the queries,” Morsch says. This may lend more transparency to the query process and allow physicians to better understand where a CDI specialist or coder found the information supporting the query. The presence of NLP technology may cause hospitals to consider automated queries. “These are queries where you may have a high enough confidence level, along with the electronic infrastructure, to allow a query to be automatically routed to a physician vs. having it screened through a CDI specialist first,” Morsch says. It isn’t something he recommends for all queries, but when clear and reliable indicators exist so coders believe there are gaps in the patient record, automated queries can potentially transform CDI efforts. The ability to create specific templates is another potential evolution in the query process brought about by NLP technology. Stults envisions a scenario where templates are created and populated “based on the extracting that you get from NLP, and then you have the ability to feed those templates to the physician.” Perhaps even further off but still in the works, she believes NLP-supported templates could give way to nearly instantaneous feedback. “In the future, you might have alerts coming back to the physicians as they fill out templates or complete documentation,” she says. Cresswell envisions NLP prompting for information that may be missing from the documentation, perhaps close to the point in time when the data are captured. “That could well be before it would get into the traditional query process,” he says. For example, symptoms that have been identified within the narrative without a correlating diagnosis could offer providers a flag that additional data are needed. “Providing those kinds of alerts back to clinicians on an automated or a semiautomated basis for the most important items could be particularly relevant,” Cresswell says, adding that this is especially relevant for organizations that have identified deficient areas as part of their CDI strategy. As hospitals work to maximize reimbursement, many are trying to make the query process more like real time. Those efforts may be accomplished “more time effectively and more immediately” by using NLP technology, Fritsch says. Missing information can be quickly identified and queries completed earlier in the process. “Instead of getting a query from a coder a day or two days later, physicians might be able to see a real-time prompt and put down the required detail right away,” Fritsch says, adding that there are beta versions in the works that have some of this functionality. Much of what coders will do is address instances where the technology doesn’t perform at 100% accuracy, something Fritsch believes will continue to be an issue for quite some time. “As with other technologies, we typically get the best results out of it if you combine it with human services,” he points out.